I've been out of the loop for a few years and haven't kept up with the changes. We're going to be onsite for a couple of weeks in early June and I'm starting to make ADRs. My son (10) wants Mickey Waffles but we don't really want to do an expensive character meal for breakfast. (we're doing a tusker house lunch). Where can we get him some Mickey waffles without coming out of pocket $150? Staceyism #3 "And it's a lot like going to the real Africa... but without all the malaria shots and stuff." Pic below is from POFQ last September. They also had the small kid's size Mickey waffles. Most resort quick service restaurants have them. Thank you for the quick replies. We'll be at Kidani Village so we can pop over to Mara. Check Sanaa. They serve breakfast there. I stayed there a couple of years ago. I don't remember if they had them or not. 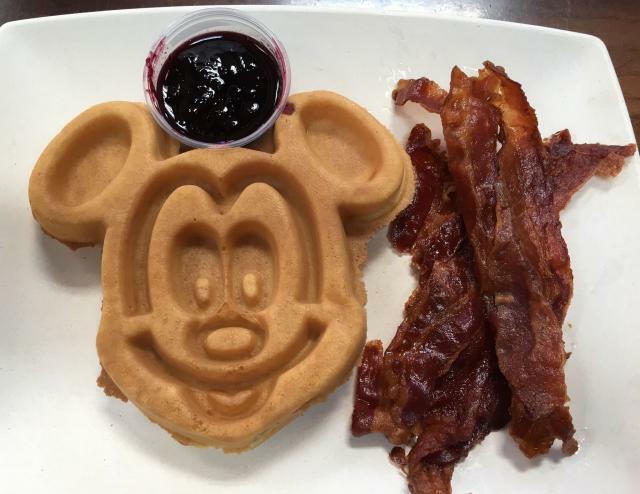 Here's the current menu at Mara - looks like a winner for Mickey Waffles! Sanaa has them on the kid's menu.